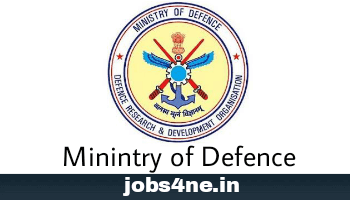 Controller of Defence Accounts, Guwahati Recruitment 2018: 9 Nos. of Canteen Attendant Vacancies. - Jobs4NE : Jobs in Assam and North East India. Controller of Defence Accounts, Guwahati Recruitment 2018: 9 Nos. of Canteen Attendant Vacancies. Applications are invited on direct recruitment basis for filling up vacant posts in the Grade of Canteen Attendant in the Departmental Canteen of Controller of Defence Accounts, Narangi, Guwahati under Ministry of Defence, Government of India. Last date of receipt of application is 60 days from the date of publication of the advertisement in Employment News. Name of the Post: Canteen Attendant. Age limit: 18 years to 25 years as on closing date of receipt of application. Age relaxation as per existing rules. Scale of Pay: Rs.5200/- 20200/- + 1800/- (GP) as per 6th CPC and Level 1- Rs. 18000/- as per 7th CPC. How to Apply: Candidates should apply as per the prescribed format only. The same can also be downloaded from Official website- cdaguwahati.gov.in. Application in any other format will not be accepted. Candidates will forward applications properly sealed in an envelope to “Dr K. Lalbiakchhunga, Asstt. Controller, Office of the CDA Guwahati, Udayan Vihar, Narangi, Guwahati-781171”; through ordinary posts/ by hand. Registered Post will not be accepted. Candidates are requested to super scribe the words, “Application for the post of Canteen Attendant” on the top of the envelope while sending the application form. a) Matriculation or equivalent certificate. c) SC/ ST/ OBC certificate. d) Certificate/ Diploma in hospitality management/ cooking/ catering (optional). Tags: 10th Standard, Assam, Central Govt.